SMALL: Sheet: 11.9"x 16.33", Design 9.7"x 14"
MEDIUM: Sheet: 17.5"x 25.2", Design 14.5"x 20.9"
We are in love with our craft Otomi stencil pattern! Inspired by traditional Mexican tribal textiles, this amazing ethnic pattern works great in a dining room, nursery or on a headboard or rug. Check out the details of this lovely design, a joyful celebration of life and all its beautiful creatures. Why buy expensive placemats or lamp shades when you can create them yourself? Reusable stencils save you money and make you feel proud of your creation. Your friends are not going to believe you stenciled this yourself! 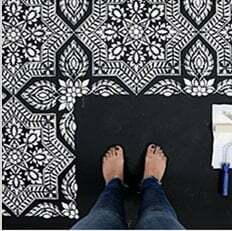 This ethnic craft stencil is perfect for DIY decor. Did you know you can stencil on fabric too? Yes, you can create custom stenciled curtains, pillows and table cloths with our stencils! When stenciling on fabric, stencil adhesive is very helpful. First, tape your ironed fabric to the surface so it doesn't move around while you stencil. Use stencil brushes, or roller, and add some textile medium (sold in craft stores) to your acrylic paint. You can also get a special fabric paint, but, frankly, good craft acrylics with a dollop of textile medium work just as well, and costs way less too! :) Let the stenciled image dry completely, 24 hours is best, then heat-set it by ironing the fabric for about 20 seconds (more or less) on a LOW setting through the piece of cloth. Heat-setting will cure the paint and prevent it from being washed off in the washing machine. Always experiment with a sample of your fabric first to ensure good results. I've stenciled on silk, cotton, linen and even sheer fabrics with great results. It's always better if your fabric doesn't have too much texture. Please make sure you watch our short step-by-step Video Tutorials!